Mat Rush. 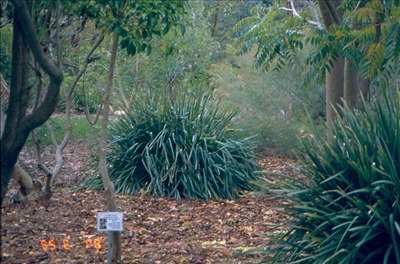 Tough perennial tussock grass closely related to Xanthorrhoea (Grasstrees). Hardy plant for well-drained soils, grows well in full sun or shade. Tolerant of heavy frost and drought. The coastal forms are usually more upright, shorter & thicker , broader leaves while the forms forms from the mountaine areas are more weeping. 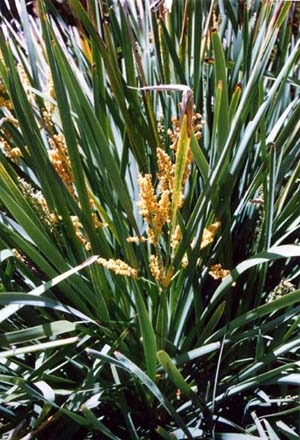 The variant from Queensland has flowers that are scented. Excellent around pools, ponds, office buildings, small or large gardens. Makes a hardy container plant especially some of the smaller forms that are now available. Review list.